We are now gearing towards the end of 2014. How was your year 2014 so far? Have you been productive all throughout the year? How much money you have saved for this year? For all of you fellow won earners here in Korea who happened to visit this blog and read about the 52 weeks money challenge that I posted in the beginning of this year, did you follow the saving scheme presented on that blogpost? Or can you even remember that? If you have religiously followed the 52 weeks money challenge, guess what, you are about to be 3 Million won richer at the end of December. If you were not able to do it or you have done it but stopped along the way, don’t worry, there’s still 2015 and you can start all over again and discipline yourself to save money for your future needs. Our colleagues from TGFI(The Global Filipino Investors)-Korea will not stop to advocate financial literacy to the OFWs here in Korea. That is why a new saving scheme has been developed courtesy of Mr. Kuripot of TGFI-Korea to give you more options to save money. 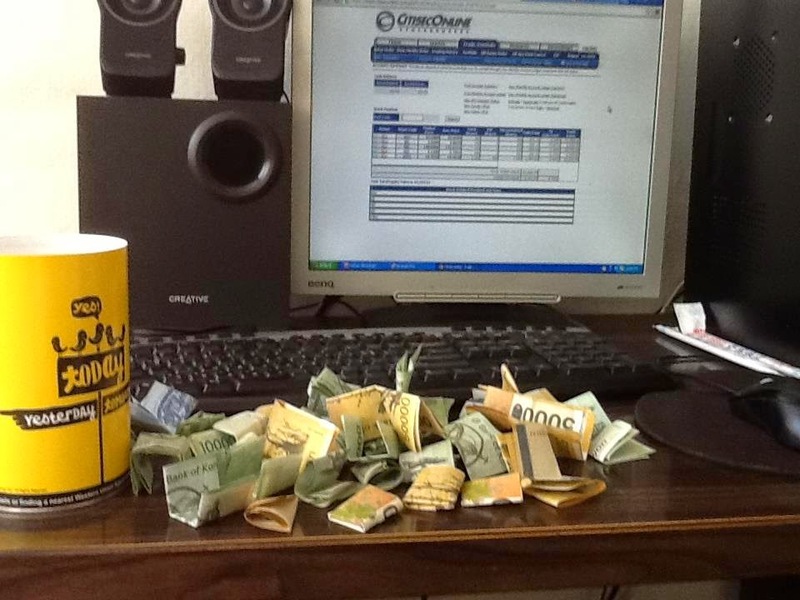 When I posted the 52 weeks money challenge, I have received several reactions from the readers. From that reactions, I have identified the pessimistic people and the optimistic ones. The optimistic minded people said that they will follow it and they found the challenge quite exciting. However, the pessimistic minded people said that they don’t have enough money to save for this challenge because they need to send it to the Philippines. Ok, we got that point. 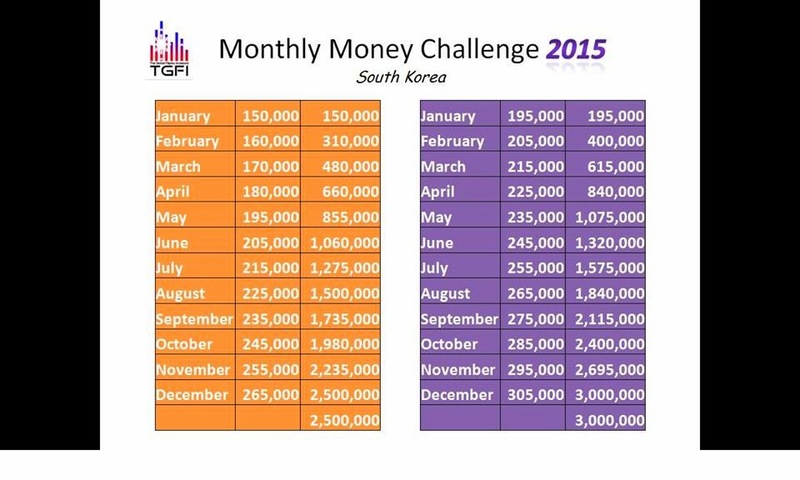 So Mr. Kuripot of TGFI Korea improvised the scheme for 2015, instead of making it a weekly challenge, he made it a monthly challenge and you have options for the money goal. 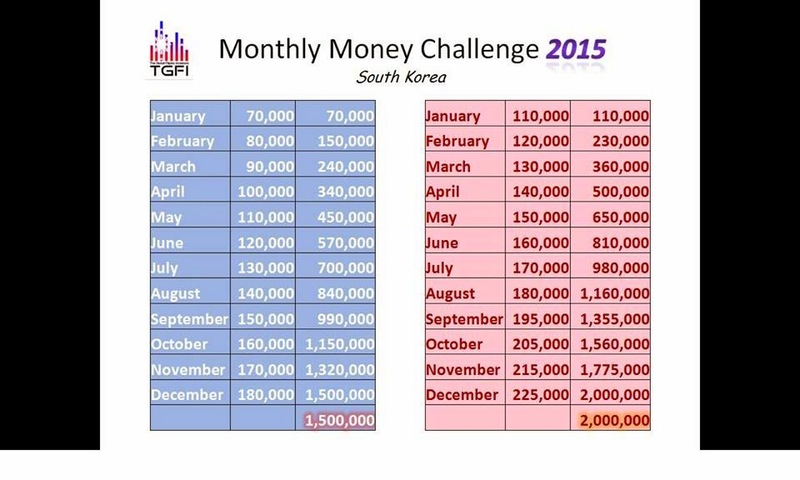 That means, if you think 3 Million won is too big to save for the whole year, you can choose the lower money goal. So I am going to present to you the Monthly Money Challenge for the year 2015. You can start doing this on January until the end of the year. If you want to learn more about financial literacy, savings, investments and anything related to finance, feel free to join the PINOY STOCK MARKET INVESTORS IN KOREA Facebook group. We have a lot of financial advisers in this group, so if you have any questions regarding money matters like how to invest in stock market, how to start a business and how to improve your financial status in life, you can post your questions and our friends from TGFI-Korea will answer you. Without further adieu, check out if you are up to these 12 Months Money Challenge, the won edition. Again this is courtesy of Mr. Kuripot, our friend from TGFI-Korea, so we should thank him for coming up with this plan and he generously shared it with us. *the third column represents the total amount of money that you have already accumulated for that particular month. And you are like, the challenge is so intimidating!!!!! 3.5 Million won and 4 Million won are too big and we have to send money to the Philippines and we have to buy things for ourselves, etc. etc. etc.... We understand your point, so here is another option for you. Much lesser demand per month but lesser money goal too. 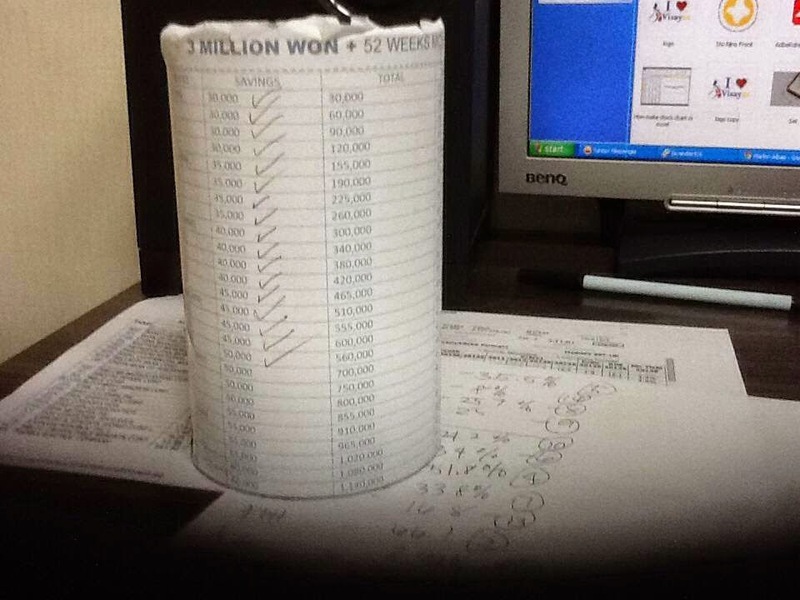 Check the table below if you can take the 3 Million won and/or 2.5 Million Won Money challenge. What???? You still find it hard to save that amount of money? Wow, you have endless reasons. Ok, take a look at the last two tables below. 1.5 Million Won and 2 Million won are not bad at all. So why are we doing this and why we have to do this? Well, aside from accumulating your money goal for the whole year, this will help you develop your attitude in terms of money. Setting aside a part of your money for your personal savings every month is some kind of a discipline. And of course, to reward yourself also to buy things you want out of this savings without the guilt feeling. Remember, your future is in your hand. We have provided you the guide, it's all up to you if you will follow it or not, but one thing is for sure, this is for your own's sake. Take the challenge and make a difference! kayang kaya ang 4M won in 12 months. kaso, wala pa ako sa korea.